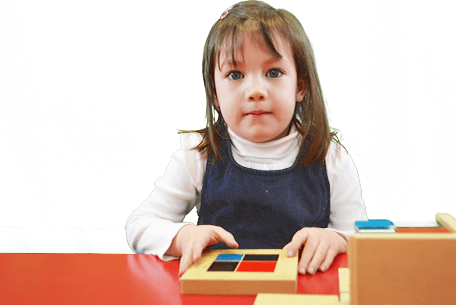 The Montessori Casa Curriculum incorporates Mathematics, Language, Practical Life, Sensorial, and Cultural activities. In addition to French lessons, students take part in Visual Art, Music and Physical Education. 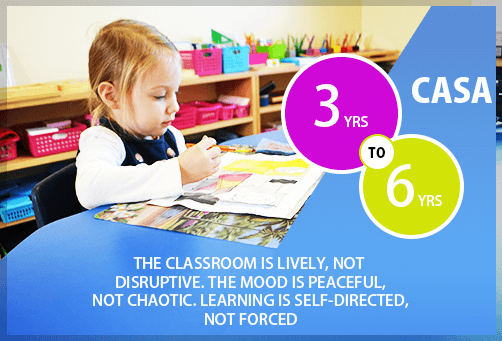 Our daily schedule allocates time for blocks of uninterrupted learning – a fundamental part of the Montessori educational experience. 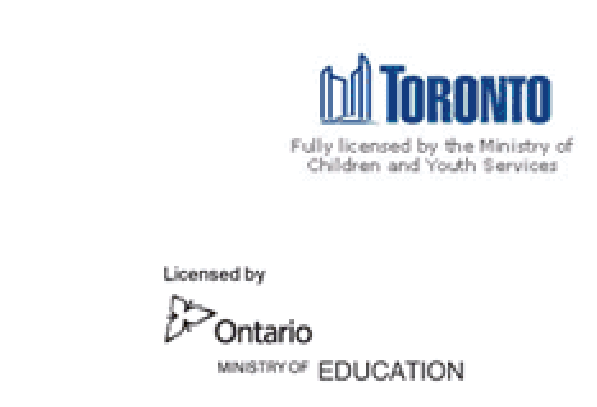 The prepared environment and curriculum addresses a full range of social, emotional, physical and cognitive needs of the 3 to 6 year old child. 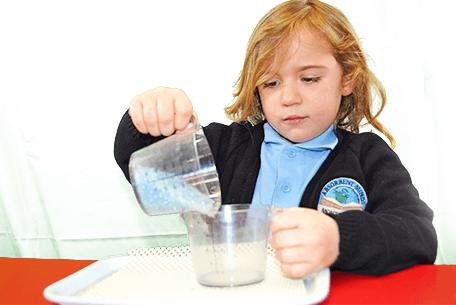 Montessori materials are carefully designed and sequenced for optimal learning. Practical life includes everyday activities. The child learns to serve snack, pour water from a pitcher, to sew, plant in the garden and clean the environment. While children delight in these activities they are simultaneously developing their independence through self-care, the care of others and the care of the environment. 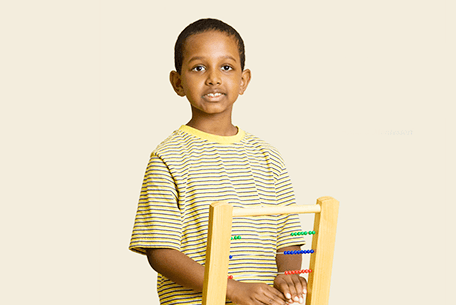 The child learns to follow a sequence of steps and develops a sense of order. The Practical Life skills prepare the child for future academic growth. 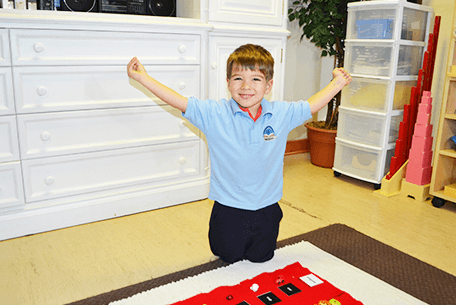 The Montessori Sensorial materials help the child distinguish the differences in size, weight, texture, sound, color, and shape. 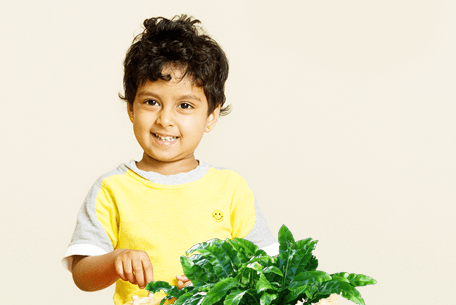 Each of the five senses is engaged by a specific activity specially designed to isolate one idea, allowing the child to develop sensorial through personal discovery. Learning to listen carefully enables the child to perceive subtle differences in the sound of the letters; experiencing the geometric shapes prepares the child for mathematical concepts. Thus, when a child develops his senses, he acquires the components for all other learning. 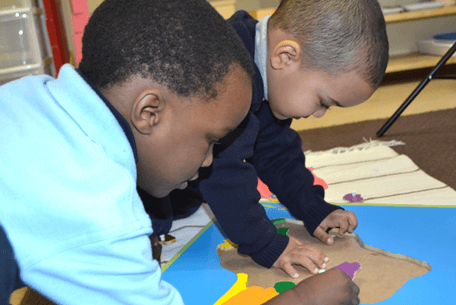 Language in the Montessori environment focuses on three main areas ; Spoken Language, Written Language, and Reading. Spoken Language includes both speaking and listening skills. The purpose of this area is to enrich the child’s vocabulary and to provide the child with tools to communicate with others. After having a diverse bank of vocabulary, sounds are gradually introduced to the children. A child masters the alphabet phonetically through tracing sandpaper letters and learning the phonetic sounds of each letter. Children use their sense of touch to feel the textured letter. As the child learns the individual sounds of the letters, he or she begins to read quite naturally by putting the sounds together into words. These are then followed by the symbols that are associated with the sounds, which opens up the next chapter of learning – Writing. Dr. Maria Montessori recognized that in a lot of instances, children’s minds are ready to form words, however their hands are not ready to write. She developed materials for the children such that they can form words with moveable alphabets. Through this exercise and ones that strengthen the pincer grip, the children will eventually begin to write. Reading evolves once the child has acquired a strong foundation of the association between the sounds and symbols. Children are required to decipher and recombine the letters in the word to sound out the word. 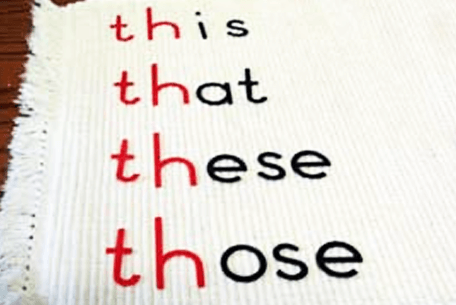 Exercises in the environment will introduce the children to phonetic reading, then gradually moving into phonograms, acquisition of grammar, sentence construction ,comprehension exercises and journal entries. At the Casa level, we try to incorporate as much French as we can while respecting the need for our students have a daily, three-hour Montessori work period. In addition to their twice a week half hour French as a Second Language class, some materials in the Casa classrooms are bilingual, and there are always books, finger-plays and songs in both languages.Students may join the French Club for extra French lessons. The Montessori math materials are perhaps some of the most inviting and beautiful works in the Montessori classroom. Maria Montessori believed that children could absorb mathematical concepts naturally. She recognized that there were sensitive periods in the child’s development whereby the acquisition of mathematics was eagerly and joyfully explored. Children discover concrete math materials to explore more abstract thought, beginning with quantity. Dr. Montessori discovered that a child who could count and recognize the symbols 1-9 could count in quantities of hundreds and thousands. They make connections between number symbols and quantity. Students continue developing basic concepts including skip counting, computation, place value and fractions with hands-on experiences. These exercises serve as foundation of basic mathematical principles, which will then prepare them for abstract reasoning and the development of problem solving skills. Through the material of the Golden Beads, the children will learn the difference between the unit, tens, hundreds, and thousands. The remarkable difference between placing a bead and a cube of 1000 beads clearly indicates to the children the concept of unit and thousands. The Cultural area of the Montessori classroom covers a variety of subjects including Geography, Science, Botany, Zoology and History. Children also explore art, drama, story telling and music Guided by curiosity about the world; children learn new vocabulary, gain a greater understanding of the needs of living creatures and explore cultures with respect and appreciation. The aim of studying culture is to allow the child to experience their place in the universe. They begin by exploring similarities between their culture and others. They learn how all beings are fundamentally related and discover ways to feel they are significant beings in this world. Then they learn how cultures around the world are different. Learning about the World as a whole allows them to develop a sense of solidarity with the global human family. Students begin to develop the appreciation and respect of other cultures, plants and animals of the world and learn about the importance of caring for the environment. 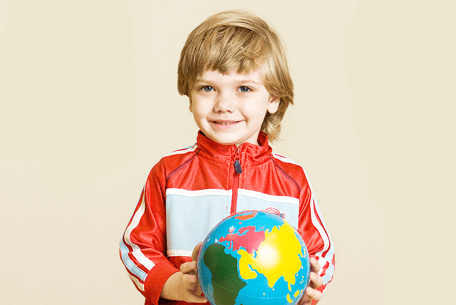 Students learn about geography, explore oceans and continents, land forms and water bodies, learn about other countries, their customs and traditions, artifacts, traditional music and flags of the world. The passage of time is conveyed to kindergarten students through a series of activities, where they learn about calendar, clocks, timeline of child’s life etc. Then they discover how much time passed before human history begins and the following evolution of the human being. Students subsequently explore artifacts to discover how early humans might have lived and how time periods acquired their name. The study of human history includes ancient and modern civilizations. The children study living and nonliving things, categories of plants and their parts, as well as life cycles. Observation and classification of animals leads naturally to understanding the world through its environment. 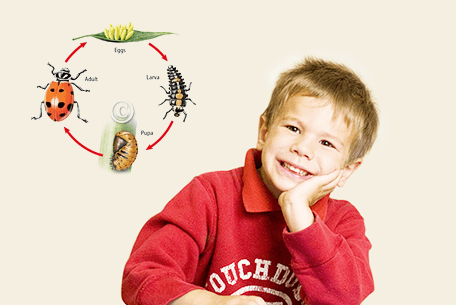 The children learn about the classification of animals, animal’s anatomy and metamorphosis. The topics include life cycle of an insect, bird, mammal, reptile, and amphibian.